Pneumatic pressure testing is a process to determine the threshold of safe and functional operation for a variety of pressure systems. Unlike hydrostatic pressure testing, which utilizes a liquid medium to exert pressure, pneumatic testing employs the use of a non-flammable gas such as nitrogen or air. Extra caution must be taken with pneumatic pressure testing. Failures are much more likely to be catastrophic when they do occur and damage to test subjects can be extensive. Pneumatic pressure tests are used primarily to prove the efficacy of seals and should never be used as a burst test. 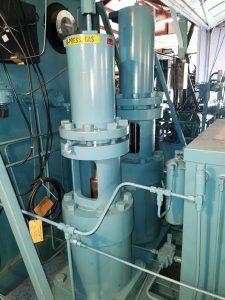 Below is a picture of Harwood’s 2-stage 200,000 PSI gas compressor used for test work. With 70 years of experience, we at Harwood Engineering are proud to offer pneumatic pressure testing services catered to your specific needs and purposes. We will work with you to design and perform a special test or provide you with the pressure testing equipment necessary to do it yourself. Contact us today to speak with one of our knowledgeable engineers and get started on your next project.